Emerald cut 9x7mm CZ shimmers on halo engagement ring crafted in 14K rose gold.The right choice to impress her on your special day.Pink gold with its romantic tone and sparkling CZs pair up to create a lovely eve date.3.00 CT TGW. CZ is an April birthstone. Email us Your Ring Size Available Ring Sizes: H, H 1/2, I, I 1/2, J, J 1/2, K, K 1/2, L, L 1/2, M, M 1/2, N, N 1/2, O, O 1/2, P, P 1/2, Q, Q 1/2, R, R 1/2, S, S 1/2, T, T 1/2 and No Extra Charge for Ring Size. 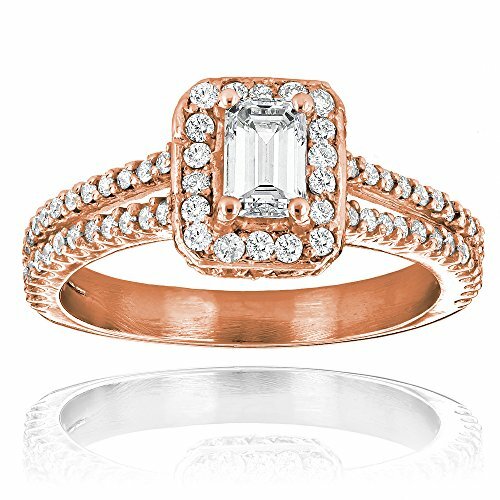 Emerald cut 9x7mm CZ shimmers on halo engagement ring crafted in 14K rose gold vermeil over 925 sterling silver.A ring that will hold her forever and strengthen your bonding.Total gem weight is 3.00 CT TGW. CZ is an April birthstone. Email us Your Ring Size Available Ring Sizes: H, H 1/2, I, I 1/2, J, J 1/2, K, K 1/2, L, L 1/2, M, M 1/2, N, N 1/2, O, O 1/2, P, P 1/2, Q, Q 1/2, R, R 1/2, S, S 1/2, T, T 1/2 and No Extra Charge for Ring Size. 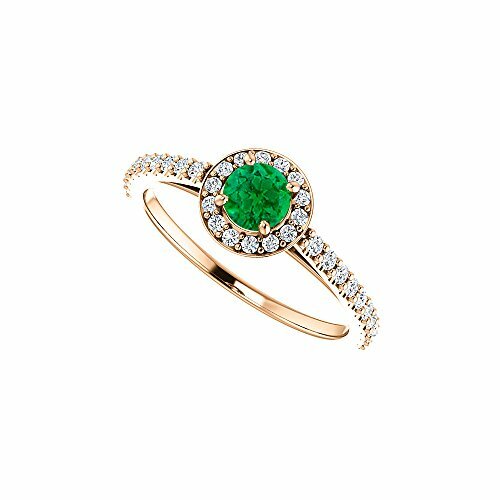 Round created emerald halo ring crafted in 14K rose gold.Unforgettable love is sure to happen with striking green hue ring.May and April birthstones jewelry.0.75 CT TGW. Email us Your Ring Size Available Ring Sizes: H, H 1/2, I, I 1/2, J, J 1/2, K, K 1/2, L, L 1/2, M, M 1/2, N, N 1/2, O, O 1/2, P, P 1/2, Q, Q 1/2, R, R 1/2, S, S 1/2, T, T 1/2 and No Extra Charge for Ring Size. 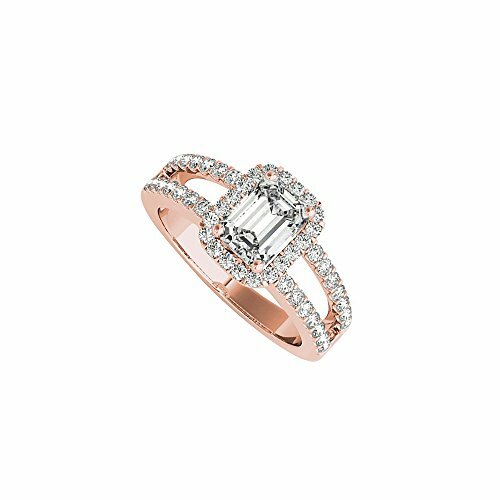 Emerald cut CZ halo engagement ring designed with perfection in 14K rose gold to make her sparkle all time.Pink hue with sizzling CZs make a great pair and is loved by romantic couples.2.00 CT TGW. CZ is an April birthstone. Email us Your Ring Size Available Ring Sizes: H, H 1/2, I, I 1/2, J, J 1/2, K, K 1/2, L, L 1/2, M, M 1/2, N, N 1/2, O, O 1/2, P, P 1/2, Q, Q 1/2, R, R 1/2, S, S 1/2, T, T 1/2 and No Extra Charge for Ring Size. Emerald cut 9x7mm CZ shimmers on halo engagement ring crafted in 14K rose gold.Smaller CZs halo the center gemstone and are accented on split shank of the ring.Perfect charmer for that special moment.3.00 CT TGW. CZ is an April birthstone. Email us Your Ring Size Available Ring Sizes: H, H 1/2, I, I 1/2, J, J 1/2, K, K 1/2, L, L 1/2, M, M 1/2, N, N 1/2, O, O 1/2, P, P 1/2, Q, Q 1/2, R, R 1/2, S, S 1/2, T, T 1/2 and No Extra Charge for Ring Size. 14K rose gold emerald cut 6X5 mm CZ halo engagement ring shimmers with sparkling CZs all over.Rectangle CZ at the center is surrounded by smaller CZs and accented on either side of the center stone.Perfect charmer for that special moment.1.00 CT TGW. CZ is an April birthstone. Email us Your Ring Size Available Ring Sizes: H, H 1/2, I, I 1/2, J, J 1/2, K, K 1/2, L, L 1/2, M, M 1/2, N, N 1/2, O, O 1/2, P, P 1/2, Q, Q 1/2, R, R 1/2, S, S 1/2, T, T 1/2 and No Extra Charge for Ring Size. This Halo Emerald Cut Diamond Engagement Ring 1.2ct in 14K Gold showcases a 1/2 carat emerald cut diamond in the center and 0.7 carats of round diamonds on the sides for a total of 1.2 carats of dazzling diamonds. 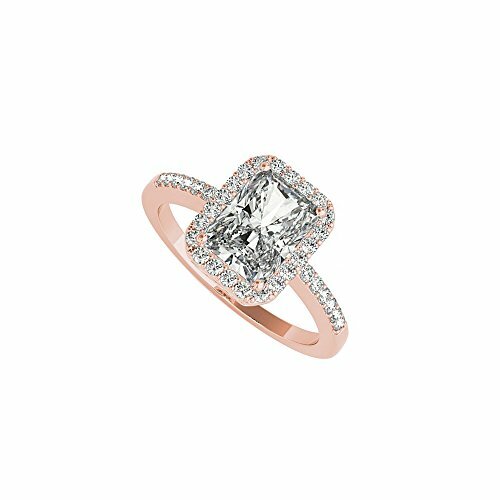 Featuring a classy design this halo diamond engagement ring is available in 14k yellow, rose, white gold. 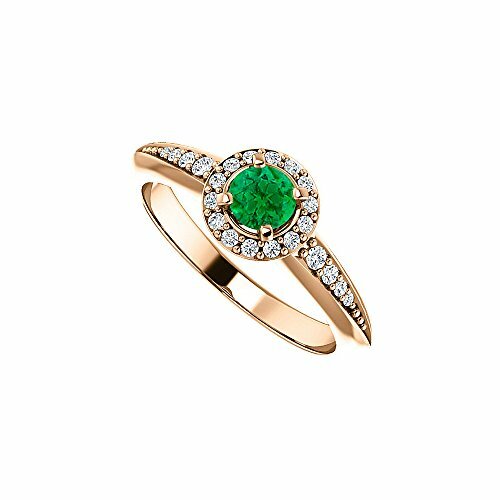 May birthstone emerald halo ring in 14K rose gold ring.Lovely romantic eve date can be made perfect with created emerald and sparkling CZs all over the engagement ring.0.75 CT TGW.May and April birthstones. Email us Your Ring Size Available Ring Sizes: H, H 1/2, I, I 1/2, J, J 1/2, K, K 1/2, L, L 1/2, M, M 1/2, N, N 1/2, O, O 1/2, P, P 1/2, Q, Q 1/2, R, R 1/2, S, S 1/2, T, T 1/2 and No Extra Charge for Ring Size. Halo engagement ring features 9X7 mm emerald cut CZ prong set at the center as primary gemstone with smaller brilliant cut CZs haloing over 14K rose gold vermeil. Perfect jewelry gift for that special one.3.00 CT TGW. CZ is an April birthstone. Email us Your Ring Size Available Ring Sizes: H, H 1/2, I, I 1/2, J, J 1/2, K, K 1/2, L, L 1/2, M, M 1/2, N, N 1/2, O, O 1/2, P, P 1/2, Q, Q 1/2, R, R 1/2, S, S 1/2, T, T 1/2 and No Extra Charge for Ring Size. 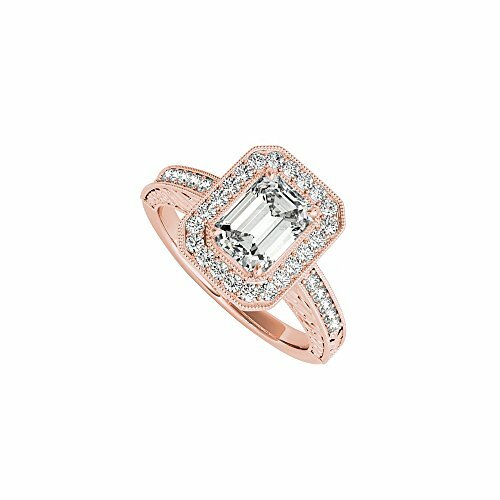 Günstige Preise, Meinungen und Bewertungen zu Rose Gold-emerald-cut-ringe finden Sie bei preison.de online.